As a speaker, the information you share is only as good as the effectiveness with which you share it. 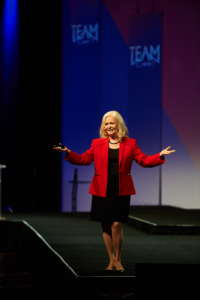 Your ability to delivery a dynamic keynote speech starts with your connection with an audience. Remember these 5 tips to create rapport and relatability with your audience. Being a great presenter starts in the preparation process. As you plan out your presentation, identify times that you can build in audience participation. When doing my talks, I ask questions as well as give the audience prompts for physical movement. Making your audience a part of your presentation not only creates triggers that will enforce certain concepts (which they will remember better)- but it also tells the audience that you were thinking of them when you created your presentation. Your ability to connect with your audience will directly affect how well they relate to the usability of your information. Stories are critical to deliver a dynamic keynote speech and great story tellers know how to make the story relevant to the listener. When using stories, you are better able to engage the hearts of your audience members. By engaging their hearts in addition to their minds, your audience will feel more directly connected to you as a person. This will further engage them in what you have to say. You have probably heard the saying that only 7% of what we communicate is verbal. This means that 93% of what we communicate is through our voice (not words) and body. Deliver a dynamic keynote speech by using all three of these elements of communication to your advantage. When I speak, I don’t stand in one spot and I always request a hands-free microphone because I use my arms and hands to help me share my message. It is important to know that it is not one size fits all for the type of body language you use. Large stage presentations require a different degree of physicality than small group presentations. Be aware of your surroundings and what level of “dramatics” in your body language is appropriate to fill the space you are in. A dynamic keynote speech feels fluid and the speaker knows how to be flexible in the delivery of their content. They have a planned approach, but don’t rely on a rigid flow to relay specific information. This comes with practice-which will allow you to develop a polished delivery to your presentation. But there is a difference between being prepared and being rehearsed. Your goal is to actively convey knowledge rather than simply repeat information that you have memorized. Authenticity is a life skill. In today’s information environment, people don’t want to just learn from afar. Audiences demand accessible mentors who do more than just share from the pages of books and from big stages. People won’t connect with you if they don’t feel you are authentic. Even worse, they will feel betrayed if they think they know about you and find that your public persona does not align with the real you. Your best strategy to deliver a dynamic keynote speech is to be true to who you are and don’t be afraid to be vulnerable. People want to cut through the noise and know they are getting the real deal when looking for trusted experts, advisors and mentors. Your ability to delivery a dynamic keynote speech isn’t just about being knowledgeable and professional. Above all else, it is about connecting with your audience while sharing your content in a way that they feel they can use the information. For more information on how I can support your development as a public speaker, please reach out to me at info@sharonlechter.com.